Anne Frank and her family hid from the Nazis for 25 months in a secret annex behind a 17th-century Amsterdam canal house. They eventually were captured and only Anne’s father survived the concentration camps, but her story lives on through the diary she kept that has been translated to over 60 languages. 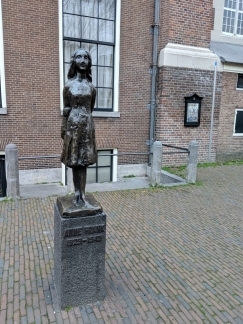 At the excellent Anne Frank House Museum, visitors can view pages from her diary, learn more about her life, and walk through the Secret Annex. 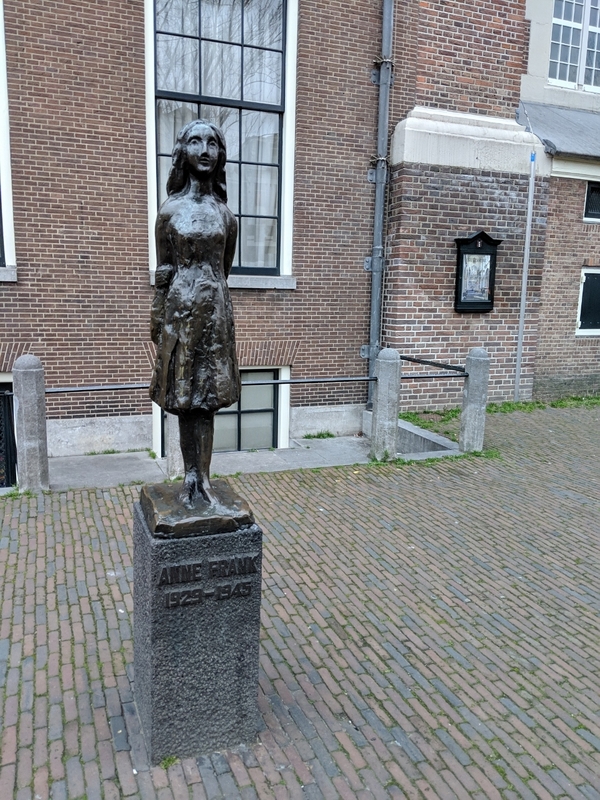 Having read the diary of Anne Frank decades ago, stepping behind the bookcase and into the rooms Anne described so vividly was a surreal and sobering experience. At the Anne Frank House Museum for a tour. Tickets are difficult to get and often sell out weeks in advance. Prior to our self-guided tour of the museum, we attended an excellent introductory program that provided historical context World War II events and and their impact on the Frank family. Drawing showing the Secret Annex where Anne’s family and another hid for two years behind her father Otto’s former business. 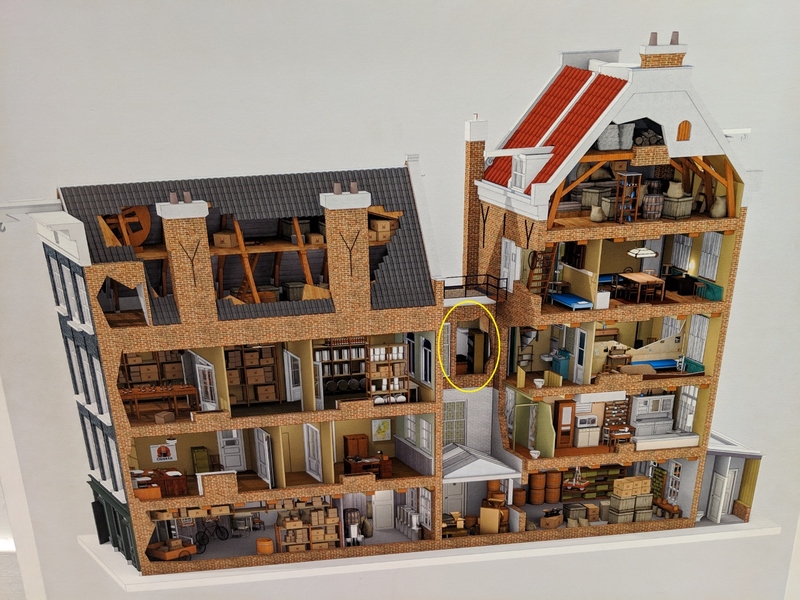 The annex was accessible only through an access passage on the third floor, hidden behind a bookcase (circled in yellow—click image for a larger view). Anne’s family lived directly behind and another Jewish family in hiding lived above. 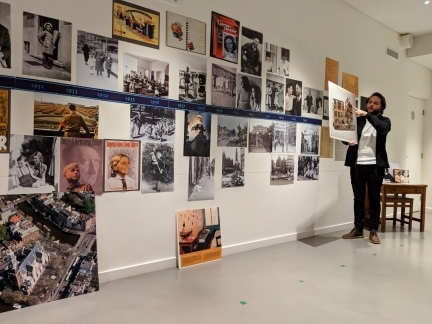 Several people who had worked with Otto Frank helped hide them and brought them provisions, books and other items. 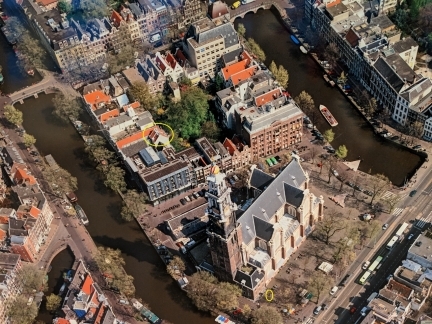 Aerial photo showing the Secret Annex, (circled in yellow roughly at center—click image for a larger view), and the Anne Frank statue at the bottom right. Dutch buildings tended to be narrow and deep because they were taxed based on their street width. Annexes such as the one Anne hid in were commonly built behind to provide more space and often were not visible from the street as they were completely enclosed by buildings on all sides. The annexes are sometimes connected to the building in front of them, but might only be connected to one of the buildings on the side. 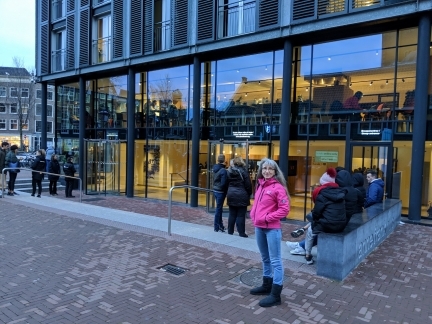 We really enjoyed our visit to Anne Frank House. The museum is excellent and it was a sobering experience to pass behind the bookcase into the Secret Annex and view pages from Anne’s diary. 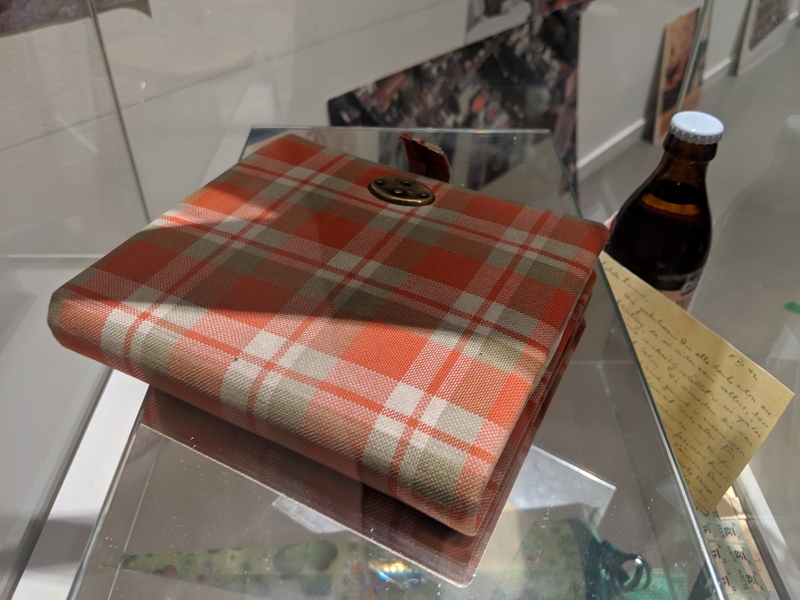 Photos aren’t allowed in the museum—this is a replica of the real diary that we saw open in the museum. 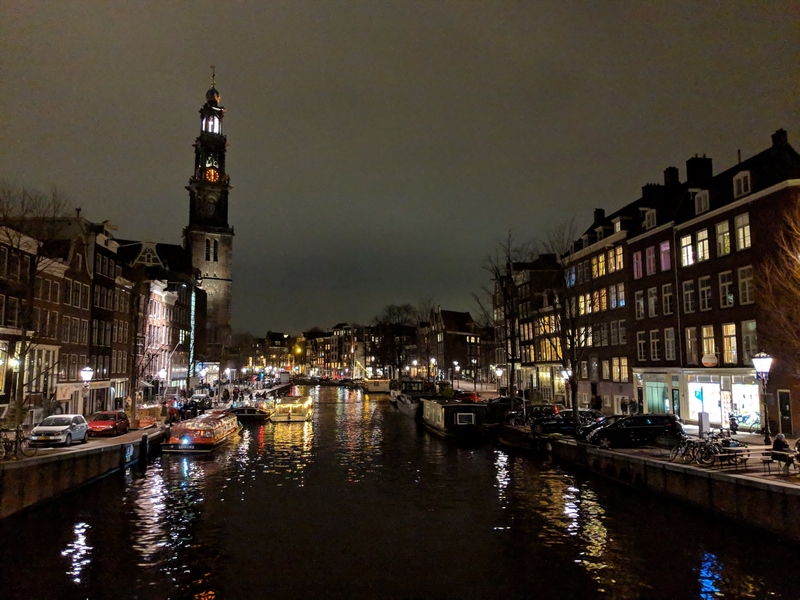 Looking south along Prinsengracht (Prince’s Canal) after our museum visit. Anne Frank House is the brightly-lit building on the left above the canal boats. The resident cat enjoying a nap at De Reiger beside our table. 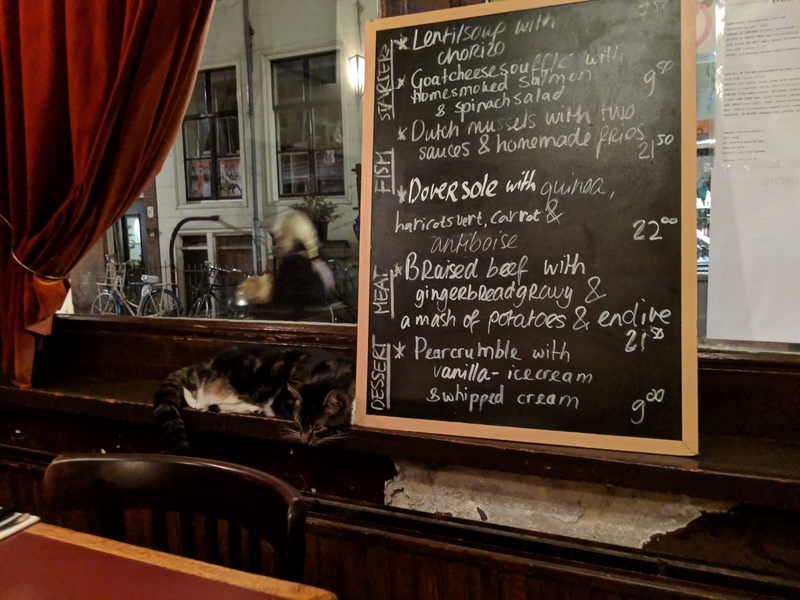 We had a great meal of their rib specialty with craft beer.